The United States Department of War, also called the War Department (and occasionally War Office in the early years), was the United States Cabinet department originally responsible for the operation and maintenance of the United States Army, also bearing responsibility for naval affairs until the establishment of the Navy Department in 1798, and for most land-based air forces until the creation of the Department of the Air Force on September 18, 1947. The Secretary of War, a civilian with such responsibilities as finance and purchases and a minor role in directing military affairs, headed the War Department throughout its existence. The War Department existed from August 7, 1789 until September 18, 1947, when it split into Department of the Army and Department of the Air Force and joined the Department of the Navy as part of the new joint National Military Establishment (NME), renamed the United States Department of Defense in 1949. 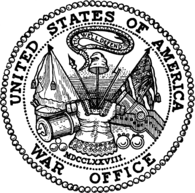 The seal of the Board of War and Ordnance, which the U.S. War Department's seal is derived from. The emblem of the Department of the Army, derived from the seal of the U.S. War Department. Shortly after the establishment of a strong government under President George Washington in 1789, Congress created the War Department as a civilian agency to administer the field army under the president (as commander in chief) and the secretary of war. Retired senior General Henry Knox, then in civilian life, served as the first United States Secretary of War. Forming and organizing the department and the army fell to Secretary Knox. Direct field command of the small Regular Army by President Washington leading a column of troops west through Pennsylvania to Fort Cumberland in Maryland in 1794 to combat the incipient Whiskey Rebellion on the frontier was an occasion never since used by American Presidents. The Possibility of re-organizing a "New Army" under nominal command of retired President and Major General George Washington and his aide, former Treasury Secretary Alexander Hamilton to deal with the rising tide of maritime incidents between American commerce ships and the new French Republic was authorized by second President John Adams in 1798 and the remote possibility of land invasion was an interesting adventure. On November 8, 1800 the War Department building with its records and files was consumed by fire. Foundation of the new military academy at West Point along the Hudson River upstream from New York City in 1802 was important to the future growth of the American army. In August 1814 during the Burning of Washington, the United States Department of War building was also burned-however the War and State Department files had been removed-all books and record had been saved; the only records of the War Department lost were recommendations of appointments for the Army and letters received from seven years previous. The multiple failures and fiascos of the War of 1812 convinced Washington that thorough reform of the War Department was necessary. Secretary of War, John C. Calhoun reorganized the department into a system of bureaus, whose chiefs held office for life, and a commanding general in the field, although the Congress did not authorize this position. Winfield Scott became the senior general until the start of the American Civil War in 1861. The bureau chiefs acted as advisers to the Secretary of War while commanding their own troops and field installations. The bureaus frequently conflicted among themselves, but in disputes with the commanding general, the Secretary of War generally supported the bureaus. Congress regulated the affairs of the bureaus in detail, and their chiefs looked to that body for support. Calhoun set up the Bureau of Indian Affairs in 1824, the main agency within the War Department for dealing with Native Americans until 1849, when the Congress transferred it to the newly founded Department of the Interior. In the late stages of the war, the Department took charge of refugees and freedmen (freed slaves) in the American South through the Bureau of Refugees, Freedmen and Abandoned Lands. During Reconstruction, this bureau played a major role in supporting the new Republican governments in the southern states. When military Reconstruction ended in 1877, the U.S. Army removed the last troops from military occupation of the American South, and the last Republican state governments in the region ended. The United States Army, with 39,000 men in 1890 was the smallest and least powerful army of any major power in the late 19th century. By contrast, France had an army of 542,000. Temporary volunteers and state militia units mostly fought the Spanish–American War of 1898. This conflict demonstrated the need for more effective control over the department and its bureaus. Secretary of War Elihu Root (1899–1904) sought to appoint a chief of staff as general manager and a European-type general staff for planning, aiming to achieve this goal in a businesslike manner, but General Nelson A. Miles stymied his efforts. Root enlarged the United States Military Academy at West Point, New York and established the United States Army War College and the General Staff. He changed the procedures for promotions and organized schools for the special branches of the service. He also devised the principle of rotating officers from staff to line. Concerned about the new territories acquired after the Spanish–American War, Root worked out the procedures for turning Cuba over to the Cubans, wrote the charter of government for the Philippines, and eliminated tariffs on goods imported to the United States from Puerto Rico. Root's successor as Secretary of War, William Howard Taft, returned to the traditional secretary-bureau chief alliance, subordinating the chief of staff to the adjutant general, a powerful office since its creation in 1775. Indeed, Secretary Taft exercised little power; President Theodore Roosevelt made the major decisions. In 1911, Secretary Henry L. Stimson and Major General Leonard Wood, his chief of staff, revived the Root reforms. The general staff assisted them in their efforts to rationalize the organization of the army along modern lines and in supervising the bureaus. The Congress reversed these changes in support of the bureaus and in the National Defense Act of 1916 reduced the size and functions of the general staff to few members before America entered World War I on April 6, 1917. President Woodrow Wilson supported Secretary of War Newton D. Baker, who opposed efforts to control the bureaus and war industry until competition for limited supplies almost paralyzed industry and transportation, especially in the North. Yielding to pressure from Congress and industry, Secretary Baker placed Benedict Crowell in charge of munitions and made Major General George W. Goethals acting quartermaster general and General Peyton C. March chief of staff. Assisted by industrial advisers, they reorganized the supply system of the army and practically wiped out the bureaus as quasi-independent agencies. General March reorganized the general staff along similar lines and gave it direct authority over departmental operations. After the war, the Congress again granted the bureaus their former independence. In the 1920s, General John J. Pershing realigned the general staff on the pattern of his American Expeditionary Force (AEF) field headquarters, which he commanded. The general staff in the early 1920s exercised little effective control over the bureaus, but the chiefs of staff gradually gained substantial authority over them by 1939, when General George Marshall assumed the office of Army Chief of Staff. During World War II, General Marshall principally advised President Franklin D. Roosevelt on military strategy and expended little effort in acting as general manager of the Department of War. Many agencies still fragmented authority, burdening the chief of staff with too many details, making the whole Department of War poorly geared toward directing the army in a global war. General Marshall described the chief of staff then as a "poor command post." President Roosevelt brought in Henry L. Stimson as Secretary of War; after the Japanese attack on Pearl Harbor, Secretary Stimson supported General Marshall in reorganizing the army under the War Powers Act of 1941. He divided the Army of the United States (AUS) into three autonomous components to conduct the operations of the War Department: the Army Ground Forces (AGF) trained land troops; the U.S. Army Air Forces (USAAF) developed an independent air arm; and the Services of Supply (later Army Service Forces) directed administrative and logistical operations. The Operations Division acted as general planning staff for General Marshall. By 1942, the Army Air Forces gained virtual independence in every way from the rest of the army. After World War II, the Department of War abandoned the organization of General George Marshall for the fragmented prewar pattern while the independent services continually parried efforts to reestablish firm executive control over their operations. The National Security Act of 1947 split the War Department into the Department of the Army and the Department of the Air Force, and the Secretary of the Army and Secretary of the Air Force served as operating managers for the new Secretary of Defense. In the early years, between 1797 and 1800, the Department of War was headquartered in Philadelphia; it moved with the other federal agencies to the new national capital at Washington, District of Columbia, in 1800. In 1820, headquarters moved into a building at 17th Street and Pennsylvania Avenue NW, adjacent to the Executive Mansion, part of a complex of four matching brick Georgian/Federal style buildings for Cabinet departments with War in the northwest, Navy in the southwest and to the other side: State to the northeast and Treasury in the southeast. The War Department building was supplemented in the 1850s by a building across the street to the west known as the Annex and became very important during the Civil War with President Abraham Lincoln visiting the War Office's telegraph room for constant updates and reports and walking back and forth to the "Residence". The original 1820 structures for War and Navy on the west side of the now famous White House was replaced in 1888 by construction of a new building of French Empire design with mansard roofs, the "State, War, and Navy Building" (now the Old Executive Office Building, and later renamed to honor General and President Dwight D. Eisenhower), built in the same location as its predecessors. By the 1930s, the Department of State squeezed the War Department from its office space, and the White House also desired additional office space. In August 1939, Secretary of War Harry H. Woodring and Acting Chief of Staff of the Army George C. Marshall moved their offices into the Munitions Building, a temporary structure built on the National Mall during World War I. In the late 1930s, the government constructed the War Department Building (renamed in 2000 as the Harry S Truman Building) at 21st and C Streets in Foggy Bottom, but upon completion, the new building did not solve the space problem of the department, and the Department of State ultimately used it and continues to use it into the present day. Coming into office with World War II breaking out in Europe, Secretary of War Henry L. Stimson faced with the situation of the War Department spread through the overcrowded Munitions Building and numerous other buildings across Washington, D.C., and suburban Maryland and Virginia. On July 28, 1941, Congress authorized funding for a new Department of War building in Arlington, Virginia, which would house the entire department under one roof. When construction of the Pentagon was completed in 1943, the Secretary of War vacated the Munitions Building and the department began moving into the Pentagon. The United States Secretary of War, a member of the United States Cabinet, headed the War Department. The National Security Act of 1947 established the National Military Establishment, later renamed the United States Department of Defense. On the same day this act was signed, Executive Order 9877 assigned primary military functions and responsibilities with the former War Department split between the Department of the Army and Department of the Air Force. In the aftermath of World War II, the American government (among others around the world) decided to abandon the word 'War' when referring to the civilian leadership of their military. One vestige of the former nomenclature are the Army War College, Naval War College and the Air War College, which still train U.S. military officers in battlefield tactics and the strategy of war fighting. ^ "The Establishment of the Department of War - US House of Representatives: History, Art & Archives". house.gov. Retrieved December 16, 2016. ^ Chap. VII. 1 Stat. 49 from "A Century of Lawmaking for a New Nation: U. S. Congressional Documents and Debates, 1774–1875". Library of Congress, Law Library of Congress. Retrieved March 24, 2012. ^ a b Methods, United States War Dept Board on Business (17 August 1889). "Business Methods in the War Department: Report of the Board Appointed in Compliance with the Request of the Senate Select Committee to Investigate the Methods of Business in the Executive Departments". U.S. Government Printing Office – via Google Books. ^ "Intro – Secretaries of War and Secretaries of the Army". United States Army Center of Military History. 1992. Retrieved 2008-10-17. Wikimedia Commons has media related to United States Department of War.